Steamboat Bill, Jr. (1928) is the last of physical comedian Buster Keaton's (the Great Stone Face) nine independent feature films and one of the last silent comedies. The film - actually co-written, co-produced, and co-directed by actor Keaton (with director Chas. 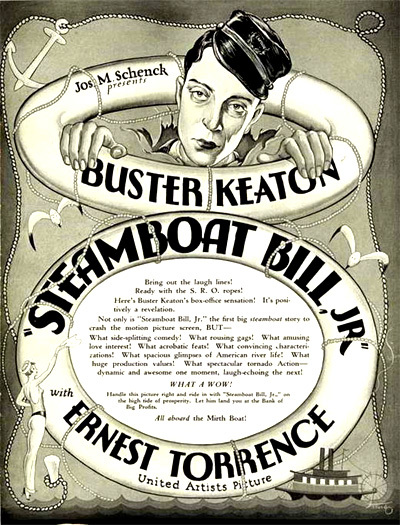 F. Reisner) was derived from a story by Carl Harbaugh, although Keaton only took credit for acting. This was Keaton's last independent film for producer Schenck, and he went on to make a few films for MGM, but none of them (except possibly for The Cameraman (1928)) reached the same heights of innovative brilliance. 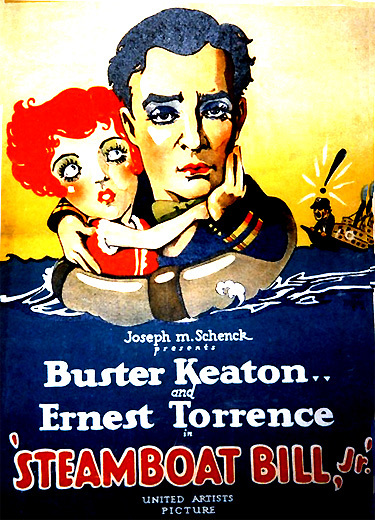 The story involves the father-son tale of an educated, effeminate, accident-prone, college-educated but simple-minded son - an archetypal underdog American hero - who ultimately is transformed and triumphs when he assists and impresses his burly, red-necked, hard-working Mississippi steamboat captain father in combating the threatening efforts of a rival tycoon to take over the Mississippi steamboat business in the South - and also wins over the business rival's daughter. The opening - a slow pan from right to left - sets the locale in the small, riverside town of River Junction, Mississippi in the Deep South. A fancy and modern "new steamer" paddle-wheeling on the Mississippi River is named the "King" - it approaches the town's waterfront dock on its inaugural cruise. The handsome riverboat is owned by formally-dressed John James King (Tom McGuire). Already moored at the dock is "the old steamer," a dilapidated boat named "Stonewall Jackson." The owner of the ancient Mississippi steamer is tough and brawny captain William Canfield (Ernest Torrence), better known as Steamboat Bill. During the festivities, he smokes a pipe and spits to the side, showing his disgust for the competition. Bill's "first and last mate" is round-faced and rotund Tom (Tom Lewis). King: This floating palace should put an end to that thing Steamboat Bill is running. Tom: (dour-faced) (to Bill): Looks like you'll have to look for a new river. Bill: I'll run on this river if I'm the only passenger on the boat. Bill hasn't seen his son for many years: "It's from my Willie, I haven't seen him since he was a baby." The telegram (and Bill's reaction) hints at the separation that young Steamboat Bill (Willie) Canfield Jr. (Buster Keaton) has had from his father, while he grew up and attended school in the East (Boston). Bill is hopeful that his grown-up son will be a muscular giant ("Must be a big lad by now" and "I'll bet he's bigger'n me") who will aid him in his conflict with the rich J. J. King. Both Tom and Bill realize that it is already Saturday and the time of the train's arrival, so they hop on the Stonewall Jackson's multi-seated, open-air, free shuttle vehicle to the train depot. At the River Junction train depot, both first mate Tom and Bill Sr. wait there to be reunited with the college graduate, but because it is Mother's Day, there are a large number of possible candidates who wear white carnations. The shoddy-looking shuttle pulls up alongside the modern passenger bus that provides shuttle service to the King steamboat. As the train passengers disembark, Bill is confused and desperate to locate his son, asking: "Any of you boys looking for a father?" When the train pulls out of the station, the young hero (with his back to the camera) first appears on the opposite side of the tracks looking up at the RIVER JUNCTION sign. Newly-graduated from college, the meek-looking, foppish effete is attired with fancy college clothes (a striped blazer and wide-legged pants, a checked bowtie), a French beret, a pencil-thin mustache, and carrying a ukulele under one arm. Feverishly, young Bill goes from person to person on the platform, holding out his lapel with a white carnation, hoping to locate his father. When he finally reaches his father, the flower has dropped from his lapel - and the display of his flower-less lapel brings no reaction. However, Bill Sr. demonstrates relief and thankfulness that the effeminate passenger doesn't appear to be his son. As young Bill entertains and attempts to pacify a crying baby in a buggy (around the corner and out of the sight of his father) with crazy dancing, Bill Sr. sees his boy's luggage tag on his abandoned bag ("Wm. Canfield Jr, Boston") and knows he has found his son - and then with a horrified, disbelieving reaction realizes what his son has turned out to be. Bill: (to Tom) If you say what you're thinking, I'll strangle you! After being reunited with his weakling, embarrassing son by a handshake, Bill Sr. hides the ukelele under his own coat and they walk to the dilapidated shuttle-vehicle. Young Bill (Steamboat Bill, Jr.) mistakenly enters the brand new King bus, and must be yanked out by his father. The bus' uniformed guide, thinking that Bill Sr. is manhandling and stealing a prospective customer, rushes over and steers young Bill back to the bus. Bill Sr. shoves the man into the rear door of the bus and slams the door behind him as the bus pulls away. Mary: Why, Willie Canfield - what are you doing so far from Boston? Mary: So is mine and you'll love him. She drags him out of the shop to introduce him to her 'loveable' father, but as she leaves to look for him, Willie is led by his father a second time to a local hat shop to try on more manly hats, in a clever, slapstick sequence. In the haberdasher store, Willie tries on one hat after another (a total of thirteen different hats in all), mostly filmed from the perspective of a mirror - a checkered taxi-cab style hat, a white fedora, the checkered hat (a second time), a black fedora, the checkered hat (a third time), a wide-brimmed straw hat, a dark felt hat, another light straw hat, a dark western hat, another straw hat, a roundish hat, a high-crowned straw hat, a pork pie (Keaton's trademark hat), and an oversized felt hat. Finally, they agree on a white, wide-brimmed hat. Going outside, the strong wind picks up a cloud of dust and blows his hat off into the river water. And so Willie must once again put on his beret (that he had earlier pocketed in the store). J. J. King: (to Bill Sr.) Is that - Steamboat Bill, Junior? Bill Sr. leads his son away a third time to try another make-over, this time to outfit him in the clothing store with "working clothes for the boat." As her father laughs at the circumstances, Mary runs to the store to Willie's side to assist him. With a little-girl tone and with wide innocent eyes, she speaks to him while rubbing his hand. He smells her hair and closes his own eyes - transfixed by her. Obviously, Mary's chagrined father doesn't want any contact between Mary and young Willie. Problems will inevitably arise and their love seems doomed when Willie falls for Mary and crosses the feuding lines of the two enemy families. Working clothes for the boat - - with her help. In the next scene, Willie is attired in a stylish, natty yachting outfit as he strides onto the dock - a swagger stick protrudes from under his right arm. His father is aghast. The first mate suggests that Bill, Sr. clunk his son over the head with a heavy wrench, adding: "No jury would convict you." On his way up to the prow of the steamboat, Willie stumbles into a deckhand, and ineptly sends a life preserver overboard. He bumps his head while ascending steps, and touches the hot surface of the steam engine. His progress is perilous as he runs into wires and mis-steps - almost plunging off the side of the Stonewall Jackson. He spots Mary and her father, standing on the deck of their new steamboat docked closeby. Willie straightens his uniform and walks closer, posing for Mary's benefit on a coiled section of rope - he is upended and flipped forward when a deckhand jerks the rope from under his feet. To regain his composure, he pretends to deliver orders to the deck worker - who has since disappeared. His incredulous father witnesses his son's gestures toward thin air. If I find him on this boat again, I'll personally wring his neck. And then he boastfully taunts J. J. King: "If anybody else is caught on this boat...my son'll handle him." Willie emerges more assertive and defiant when he repeats the insult, although his father cuts short his boldness and conquest by dragging him away (inadvertently causing him to painfully straddle a deck cable). The scene concludes with the symmetrical shot of J. J. King dragging his daughter away. I'm trying to teach you to run it - - not 'wreck' it. But he is quickly amused and congratulates his son (and shakes his hand) after viewing his quarreling rival in the water. Willie's father bites off a chunk of chewing tobacco and offers his son a small plug. When he heartily slaps his son on the back, Willie swallows the foul-tasting stuff and faints weakly onto the floor. Eight Bells and all is wrong. ...I will be waiting in the salon. If you really care for me come tonight. X Kitty. I'll pick the young man for you - and it won't be the son of a river tramp. Young Willie is admonished with the same orders from his father regarding Mary, frustrating his romantic ambitions. I'll pick the young lady for you - - and it won't be a girl with a father like that. After his father has left, Willie removes his nightshirt, revealing that he still intends to rendezvous with Mary - he has dressed himself in his father's oversized clothing. He plumps up his bed to simulate that he is sleeping there, and escapes through a window, but falls off the top deck onto the next level. He tumbles down to a lower level, and inevitably plunges into the water while inadequately setting up a plank to bridge the gap between the boat and the deck of the King. After Bill, Sr. has forbidden Willie to see Mary, he watches his drenched son climb up the side ladder of the rival steamboat - causing him to exclaim to himself: "Back to Boston you go." On board the King, J. J. King, an officer, and Willie all end up in the water. When Willie swims to a section of the dock to emerge from the water, he frightens a young black boy who is playing a guitar - the upset lad tumbles over backwards and runs away.